Growing up, my siblings and I were thrown into the world of swimming lessons at a young age. Being a family that spent the summer months at the cottage meant that we had to learn to swim — mainly because we spent more time on the water than we did on land. When it comes to public swimming pools, I also spent my fair share of time in the depths of highly chlorinated water. Although I had nothing but good times, knowing what I know now, I’d rather stick to the lake — algae and all. With summer now in full-swing, you may be considering a refreshing dip in your local pool. Before you do, I just want to share a little bit of valuable information with you. (Spoiler: public swimming pools can be n-a-s-t-y). I can still remember the potent smell of chlorine as soon as I’d step into my local YMCA. Growing up in a small, rural town, it was a treat to go to these types of places. As my siblings and I would splash around, we likely got a big ol’ gulp of water or two in our mouths. Of course, what I didn’t know, was that those mouthfuls were essentially a combination of dirt and germs. Lovely! Before you pop down to your local swimming pool, here’s what you should know. As stated by the American Chemical Society, although pools are disinfected, they are not as clean as people believe. As each new swimmer jumps into the pool, more and more microbes are being released into the water. This can lead to viruses in your ears, eyes and gastrointestinal system. Unfortunately, this can lead to everything from earaches to pink eye. I know, this isn’t the most desirable image — so I apologize! However, it’s important to understand that this is not uncommon. As stated by the U.S. Centers for Disease Control and Prevention (CDC), feces is “frequently” introduced into the pool water. 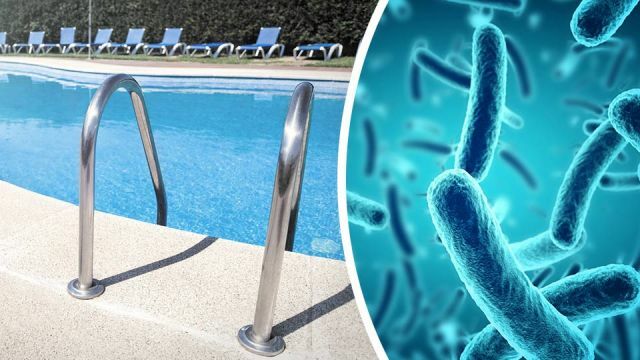 When testing pool filters, 58 percent tested positive for E. coli (which is a bacteria normally found in the human gut and feces). In addition, 25 percent of people admitted that they would go swimming within an hour of having diarrhea. Many refer to public pools as public washrooms (yes I know, it’s hard to wrap your head around that one). Although gross to think about, in many ways, urine is fairly sterile. However, the issue lies in the components of urine that react with chlorine. It is believed that this combination can increase your exposure to carcinogens. It’s not nice swimming in a chlorine bath. However, for most people, it provides a sense of security in terms of sterilization. Although chlorine will kill many germs, there are some that cannot be beaten. You may have heard about one of these germs, which is known as crypto. Cryptosporidium or “crypto” for short, made headlines as the CDC warned about potential illnesses linked to this germ. In pools that are well taken care of, crypto can live for up to ten days. Those who are exposed can experience diarrhea for one to two weeks. As stated above, when certain chemicals begin to interact with chlorine, this can result in a toxic cocktail. Even if there was no urine present (which is highly unlikely), there are still compounds in pool water from human sweat and from regular sunscreen use. The real concern is that these byproducts could cause genetic damage. A dip in the pool can be refreshing, which may be why 52 percent of people do not shower before heading to a public swimming pool. So, you can imagine how much dirt and how many germs end up in the pool water (not to mention potential pathogens). What’s worse, is that adults tend to ingest approximately half an ounce every time they swim (children likely swallow double that amount). We’ve touched on poop already. However, it’s important to note that there are baby pools for a reason. Although these pools tend to be safer for young children, they also keep diapers out of the pool. The fact of the matter is, water diapers simply do not work. Countless studies have shown that these diapers leak and seep. At the end of the day, the rate of outbreaks from public swimming pools is believed to be on the rise. As public pools become more common and accessible, there are more opportunities for outbreaks to occur. What’s worse, is that when there are documented outbreaks, approximately three-quarters of the pools pass as being properly chlorinated. After reading the above information, you’re likely thinking the same as me — lakes and rivers never seemed so appealing when it comes to a hot summer’s dip. Hey Buddy!, I found this information for you: "7 Things You Need To Know Before Swimming In A Public Pool This Summer". Here is the website link: https://www.thealternativedaily.com/7-things-you-need-to-know-before-swimming-in-a-public-pool-this-summer/. Thank you.